This tutorial is about 30 Eclipse keyboard shortcuts, this list is by no means complete and I will suggest you guys share eclipse shortcuts listed other than here to make this more useful. 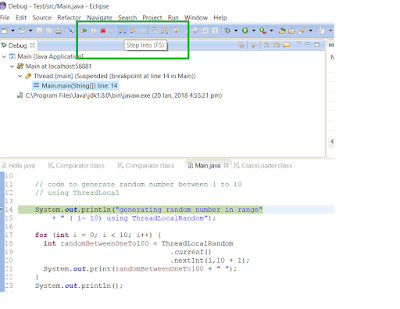 Eclipse is the most used Java development IDE and knowing these Eclipse shortcuts not only improve your productivity but also makes you more efficient. You will have more time for things you like to do. Using keyboard shortcuts also helps to impress colleagues and shows that you have a good hold on tools you used for Java Development. If you are a Java developer, who use Eclipse as your main IDE for all-purpose e.g. coding, development, and debugging, then I also suggest you take a look at Beginners Eclipse Java IDE Training Course, one of the best course to learn how to use Eclipse effectively from Java programmer's perspective. I was a big fan of Netbeans IDE before coming across Eclipse because I was from the J2ME background and Netbeans provide sophisticated IDE environment to enable you to build, debug and run your Java application in various mobile emulator including some advanced processing options e.g. preprocessing, setting up Exception breakpoint etc. From that time I love to know keyboard shortcuts on IDEs and other tools, I used for development including Edit Plus, Notepad++, Microsoft Excel etc. Knowing your tools better certainly helps you to deliver more in less time and find something really quick when a production issue arise. As I said, I was a big NetBeans fan at the start of my career but hen I joined an investment bank I came across Eclipse IDE, since everybody in my team is using Eclipse and Netbeans IDE was not available in the company (don’t know why NetBeans was not allowed even though it was free) I have decided to go Eclipse way. Later I found that Eclipse is most suited for that distributed core Java application which runs on Eclipse and depends upon a proprietary Linux library. It wasn't possible to run the whole application in Windows and that time some of the cool features of eclipse like. Remote Debugging, Conditional Breakpoints, Exception breakpoints, and Ctrl+T and Ctrl+R kind of shortcuts really saved my life. Here I am sharing a list of 30 Eclipse keyboard shortcuts which I found most useful and used in my day to day life while writing code, reading the code or debugging Java application in Eclipse. Btw, if you are new to Java world, I suggest you to first learn Java by joining a comprehensive course like The Complete Java Masterclass, which is recently updated to cover the latest Java version. Here is my list of 30 chosen Eclipse IDE keyboard shortcuts for Java developers. It's useful for both core Java developer and Java web application developer using Eclipse IDE for web development. This keyboard shortcut in Eclipse is my most used and favorite shortcut. While working with a high-speed trading system which has a complex code, I often need to find classes with the just blink of the eye and this Eclipse keyboard shortcut is just made for that. No matter whether you have a class in your application or inside any JAR in the workspace, this shortcut will find it. This is similar to above Eclipse shortcut with the only difference that it can find out not only Java files but any files including XML, configs, and many others, but this eclipse shortcut only finds files from your workspace and doesn’t dig at the JAR level. This is another beautiful Eclipse shortcut which can fix up any error for you in Eclipse. Whether it’s missing declaration, missing semi-colon, or any import related error this eclipse shortcut will help you to quickly sort that out. Another Eclipse keyboard shortcut for fixing missing imports. Particularly helpful if you copy some code from other file and what to import all dependencies. You can further see The Eclipse Guided Tour - Part 1 and 2 on Pluralsight to learn more about code formatting shortcuts in Eclipse. In this section, we will see some eclipse keyboard shortcut which helps to quickly navigate within the file and between file while reading and writing code in Eclipse. 9) Alt + right and Alt + left for going back and forth while editing. 16) Go to a type declaration: F3, This Eclipse shortcut is very useful to see function definition very quickly. 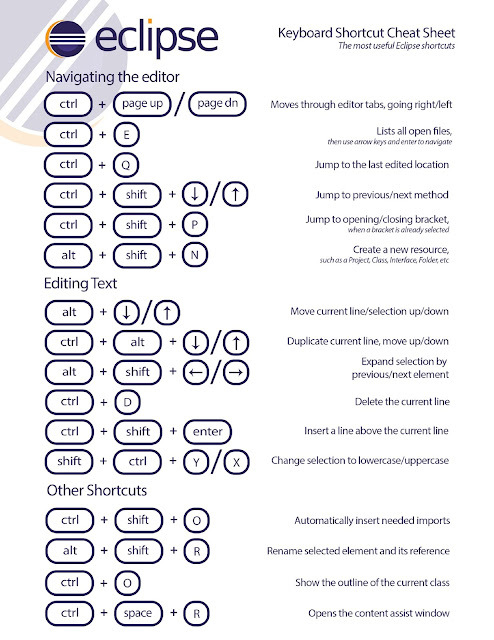 Apart from these keyboard shortcuts, learning how to debug Java program in Eclipse is also a skill. 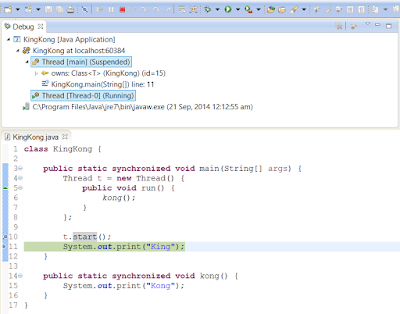 There are so many debugging tools and features available in Eclipse, which many Java programmer doesn't know e.g. conditional debugging, hit count, and remote debugging. If you really want to become a good Java developer I suggest you improve your debugging skill and if you need some help with Eclipse Debugging Techniques And Tricks is the best place to start with. 5) Ctrl + / for commenting, uncommenting lines and blocks, see here for live example. 6) Ctrl + Shift + / for commenting, uncommenting lines with block comment, see here for example. 11) Ctrl+Shirt+W for closing all files. 16) Select text and press Ctrl + Shift + F for formatting. You can further see Eclipse IDE for Beginners: Increase Your Java Productivity to find live examples for most of these shortcuts. It's a free course on Udemy so you don't need to pay anything. These are different Eclipse keyboard shortcuts which doesn’t fit on any category but quite helpful and make life very easy while working in Eclipse. 21) Go to other open editors: Ctrl + E.
23) Hop back and forth through the files you have visited: Alt + ← and Alt + →, respectively. 26) Ctrl+Shift+L to view the listing for all Eclipse keyboard shortcuts. 27) Alt + Shift + j to add Javadoc at any place in Java source file. 28) CTRL+SHIFT+P to find closing brace. Place the cursor at the opening brace and use this. 29) Alt+Shift+X, Q to run Ant build file using keyboard shortcuts in Eclipse. 30) Ctrl + Shift +F for Autoformatting. If you need to see these shortcuts in action, you can also join The Eclipse Guided Tour - Part 1 and 2 online courses on Pluarlsight. It's not free but cost you around $29 monthly subscription fee but also give you access to more than 5000 courses on Pluralsight on the latest technology, which is totally worth it. Remember, we are technical people, if we are not learning which means we are going backward. If you have some more useful Eclipse keyboard shortcuts then please post as comments, I will include them in this list. These Eclipse shortcuts will mostly work almost all Eclipse versions e.g. 3.5, 3.6 Helios, Eclipse Ganymede, and Indigo. Let me know if you face any issue while using these Eclipse shortcuts in any particular version of Eclipse IDE. 10 Things Java Developer should learn in 2018? Thanks for reading this article so far. If you like these Eclipse keyboard shortcuts then please share this article with your friends and colleagues. If you have any questions or feedback, please drop a note. Good list of short cuts. Should have mentioned Ctrl-Shift-L to get this list and Ctrl-Shift-L twice to customize it. Thanks for your comment Anonymous. yes Ctrl + Shift + T can be used to find classes from jar and that's what the difference between Ctrl + Shift + T and Ctrl + Shift + R. I also used Ctrl + Shift + T to findout which class comes first in classpath and its very useful if you have two classes with same name in two jar's and both jar in your classpath and one of them work and other doesn't. Thanks for your comment Keyboard shortcuts I visited your site and it has really good collection of keyboard shortcuts for various technology including eclipse 3.0. Thanks Gautam for informing us about Ctrl-Shift-L. I have included in main list for benefit of we all. Thanks Anonymous, Its good to know that these eclipse keyboard shortcuts are useful for you. To go along with #28 Ctrl+Shift+P, I find Alt+Shift+UpArrow or Alt+Shift+DownArrow useful when both braces are not visible on the same screen. Place the cursor next to the brace you want to match, then Alt+Shift+UpArrow and the matching braces and the code in between will be highlighted. Pressing Alt+Shift+UpArrow again expands the selection further. The highlighting can make brace matching much more evident. Furthermore, this highlighting can be used on any logical block of code - put the cursor in the middle of any word (a string, a method,...) and try it. @Anonymous thanks for your valuable suggestion, this eclipse shortcut indeed sounds quite useful , going to try it. Thanks Javin for this nice post. I've also compiled a list of useful Eclipse Keyboard Shortcuts and also uploaded a video showing how to use these shortcuts while programming. What is Eclipse shortcut for static import in Java 5 ? is there any keyword shortcut to go from top of the page to bottom of page in Java Editor window ? is there any book to learn Eclipse IDE? I want to master this IDE and increase my productivity by learning lots of tips, tricks and shortcuts. please let me know, if there is any comprehensive tutorial or book exists for Eclipse. One of the keyboard shortcut I often use is Alt +Shift +s and Generate getter and Setters to generate automatic code mainly getter and setter. First thing I do in every Eclipse installation. I mostly use Ctrl + Shift + F to format source code in Eclipse. CTRL+E To navigate between open editor tabs. This is an awesome java cheat sheet! I need to print them out!